One major advantage of modular construction is the consistent and reliable quality of the structures. Every modular building that Panel Built, Inc. manufactures is built in the same factory, by the same people that have completed this process thousands of times in the past. Every day they use the same tools and work with the same people and in the same environment. They know these structures as well as anyone in the world, and this consistent work environment builds consistent quality of work. However, this consistent quality of work is not available in all corners of the globe. In rural areas, companies may not have a construction company available that can deliver a structure that can meet proper specifications, or they may not be familiar with that particular facet of the industry. In fact, the necessity for quality construction in rural areas abroad is what gave birth to modular construction 180 years ago. In 1837, Australia started growing with English “settlers.” However, as a new society, they needed to building homes for the settlers and growing families. The only problem was that the vast majority of inhabitants of the continent we, not skilled laborers, and there certainly were not any architects. So, they needed to solve their housing problem another way. In order to address this housing crisis, Henry Manning, a carpenter in England, developed a prefabricated house that he dubbed the “Manning Portable Cottage.” Henry Manning would build the components of these houses in his shop in London then ship the pieces over to Australia, where they would be assembled. The then experiment turned out to be quite the success as Henry Manning soon had many different designs available for his cottages, and the homes became a part of the growth of a number of English colonies. Today, we can find similar needs across the world with a variety of structures. Some nations have different building codes or standards than other nations or in some cases, very little regulation at all. Or the building project takes place in an area with little to no other human activity. In these instances, an outside manufacturer is needed in order to ensure the quality of the product or in order to build the product at all. For instance, a United States military base in Africa needs a way to protect the base’s guards while they are on watch. With the guardhouse being on a military base, it naturally incurs a higher threat level that would require the booth to have a certain amount of bullet resistance. Unfortunately, it could prove to be very difficult to find a supplier of this unique product in the area or find a supplier reliable enough to meet the military’s strict standards. That is where modular construction would come in. 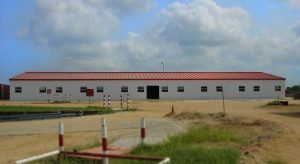 Being a proven ballistic rated guard house manufacturer in the United States and supplying to the United States military on a number of occasions, the military base in Africa could rely on a company like Panel Built to more than satisfy their standards. The entire structure would be made in our facility, shipped abroad, and all that would be left to do at the project site would be the installation. This method has proven to be a great way to ensure the quality of new structures abroad. Here are a few examples of Panel Built, Inc. doing just this to various countries throughout the world. The United States Air Force was looking for offices to put in a hangar in Sicily. As the job was for the US Military, there were stringent specifications and code requirements that needed to be met for the facility. They wanted a 21’ high two-story modular office system totaling 800 square feet of office space. This office building would hold an office and conference room on the first floor and three offices on the second floor with a catwalk leading to each of the office entrances. Ultimately, Panel Built was chosen out of the other options (including stick-built). After being shipped approximately 5,230 miles away from our facility to the airport hangar on the island of Sicily, Panel Built was ready to assemble it with our own installation team. Through the use of modular construction, the structure was able to be assembled in one month with minimal site disruption. Although none of the crew had visited the job site in the past, the building was able to be fitted against the right bay of the hangar thanks to fantastic coordination between Panel Built and the contracting officer. 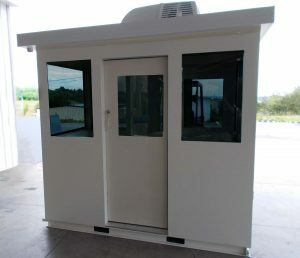 Panel Built’s customer was in need of multiple, very unique guard houses that were to be shipped to South Korea. The guard houses were to be ballistic rated, and they needed them as soon as possible. There are very few manufacturers capable of manufacturing a guard house to these specifications, not just in the United States, but in the entire world. 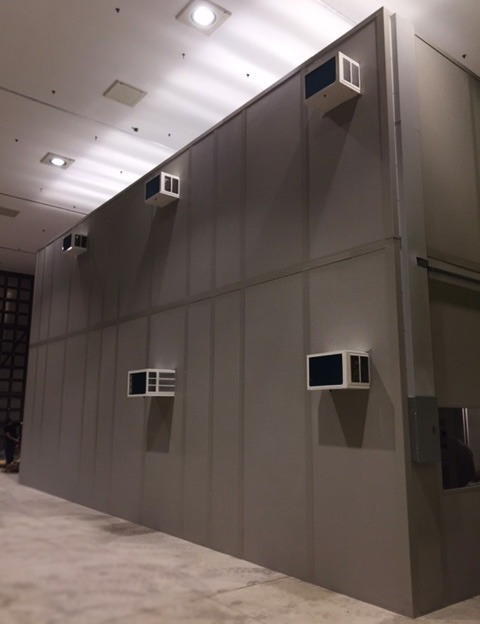 However, Panel Built, Inc. was the only manufacturer willing to commit to their strict project lead time, and we were chosen to take the job! And in three months from the placement of the order, Panel Built produced six ballistic rated guard houses and shipped them off to South Korea. In this situation, modular construction aided the customer in two aspects. First, this was an incredibly unique project that could only be handled by a few manufacturers in the world. There were not readily available manufacturers in the country that we up to the task. But since modular construction allows these structures to be manufactured offsite and then just installed at the job site, the issue of scarcity was solved. Finally, modular construction also helped satisfy their short project lead time. With the guard houses being manufactured away from the job site, the customer was able to prep the job site while the structures were being built! These processes happening concurrently allow for the project time to be reduced. Chevron’s former subsidiary Chevron Oil Congo needed help building a series of structures in a remote location in the Democratic Republic of Congo. As you can imagine, Chevron had very high standards for the location of the building. Over the scope of the project, Panel Built manufactured a 60’ x 140’ exterior building, a 40’ x 44’ exterior building, as well as a number of steel canopies in order to provide shade from building to building, over 10,000 square feet altogether. Similar to modular construction’s beginnings, this project was born out of the necessity of needing the quality construction that could be relied on to hold its durability. Panel Built, Inc. was able to offer Chevron a consistent product that was used to house some of the employees of their facility. Panel Built’s most recent overseas project was a mezzanine system installed in the heart of Greenland. The most challenging part of this project was definitely the location. The science station in which the mezzanine was installed was located on the apex of the Greenland Ice Sheet, an area that is not exactly easily accessible. As you can imagine, there are not a whole lot of construction companies on the ice sheet… Options for increasing their storage space was understandably very limited. When Panel Built was chosen to be the manufacturer for the job, we knew there were going to be a lot of challenges for the project. 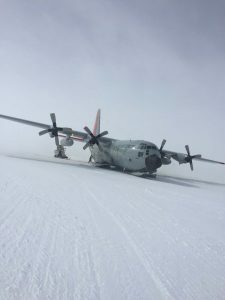 The most important aspect was the precision measurement of the materials that were sent to the job site, and assurance that the installation crew in Greenland could efficiently be put together. 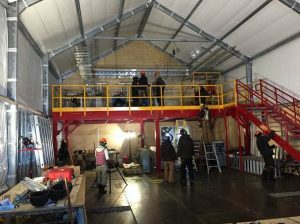 So, we assembled the mezzanine in our own facility with the Greenland crew present, so that the installation would go smoothly on the actual job site. The nearly 500 square foot mezzanine was installed without issue and completely on schedule. Modular construction has a number of benefits, but perhaps its best quality is its ability to provide quality construction to areas all over the globe, no matter how remote they may be. Panel Built has shipped modular construction projects to companies in four of the seven continents on Earth with hopefully more soon to come. No matter where the job is located, Panel Built’s number one goal is to take care of our customers’ space needs with excellence and great customer service. If your company is interested in a modular construction project, call us at 800.636.3873 or send us an email at info@panelbuilt.com.